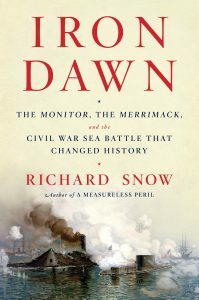 Author Richard Snow argues that no single sea battle has had more far-reaching consequences than the one fought in the harbor at Hampton Roads, Virginia, in March 1862. The Confederacy, with no fleet of its own, built an iron fort containing ten heavy guns on the hull of a captured Union frigate named the Merrimack. The North got word of the project when it was already well along, and, in desperation, commissioned an eccentric inventor named John Ericsson to build the Monitor, an entirely revolutionary iron warship – at the time, the single most complicated machine ever made. Abraham Lincoln himself was closely involved with the ship’s design. Rushed through to completion in just 100 days, it mounted only two guns, but they were housed in a shot-proof revolving turret. The ship hurried south from Brooklyn (and nearly sank twice on the voyage), only to arrive to find the Merrimack had arrived blazing that morning, destroyed half the Union fleet, and would be back to finish the job the next day. When she returned, the Monitor was there. She fought the Merrimack to a standstill, and saved the Union cause. As soon as word of the battle spread, Great Britain—the foremost sea power of the day—ceased work on all wooden ships. A thousand-year-old tradition ended, and the path to the naval future opened. Please register here or contact NMHS at 914737-7878, ext. 0 if you plan to attend. A $5-$10 donation is appreciated. 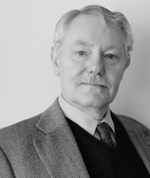 After the lecture, NMHS will host a luncheon—$25 prepaid with cash bar. Reservations are required for lunch. Be sure to Subscribe to our YouTube Channel to see the presentation online!